Acoustical ceilings are an excellent way to reduce noise within your space. 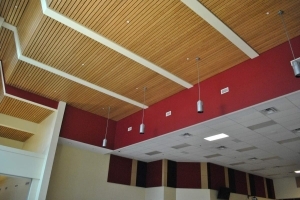 Commercial acoustical ceilings offer noise reduction solutions in a variety of products including mineral fiber, fiberglass, perforated metal, and perforated wood. Your ceilings can enhance your space in bright whites, bold colors, cool metals, and warm woods. We can give you the choices available for your design flexibility and the acoustical performance you need for your commercial interior. Ceiling clouds and ceiling canopies can be used for spot acoustics or to highlight a space within your interior. Beautiful trims can be used to accent the curved, flat, and shapes of the clouds and canopies. A variety of acoustical panels whether they be wood, metal, or colors are available to use in these applications. Define your interior space with a rich, warm wood ceiling. You will be intrigued by the variety of styles available in veneered wood or solid wood finishes. Whether looking for a traditional or a contemporary look, Cincinnati Interiors provides the choices to meet your interior finish needs. 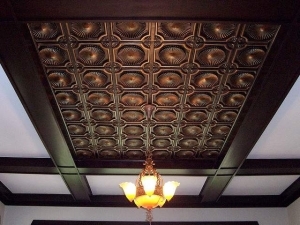 Tin ceilings are available for the historical look in your building or to restore your historical certification in your locale. A variety of patterns are available to match your existing tin application. We can install fabric wrapped baffles and diffusers suspended from your structure which can be a very effective acoustical solution in large, open, and noisy spaces. 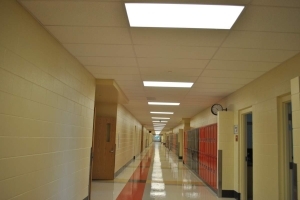 Tectum ceilings are a highly useful noise control solution for abuse-resistance and high-traffic, high-impact applications. 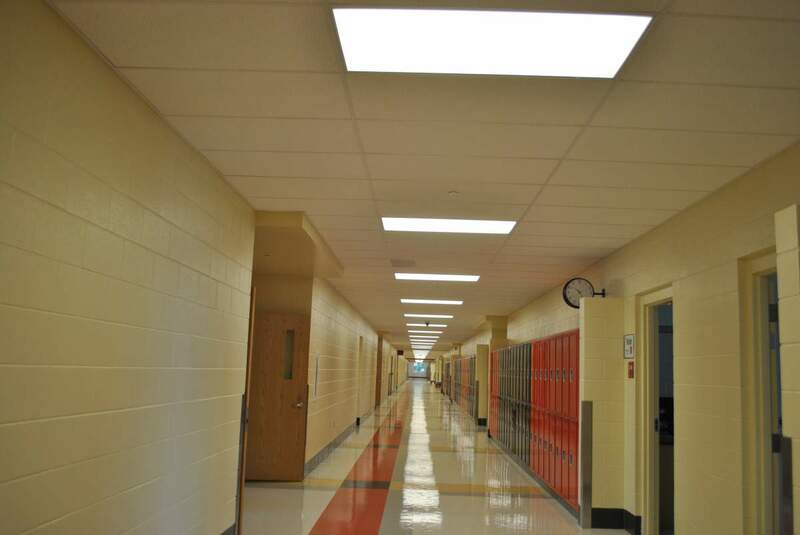 Commonly used in schools, Tectum is a very durable product that has gained widespread acceptance by designers in its 50-year history. Every commercial venue has its own personality. 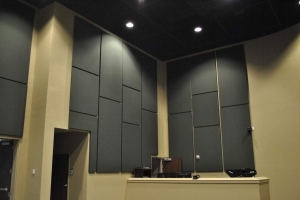 With acoustic wall panels, your space can be accented with a variety of colors and fabrics, edges and finishes while achieving your noise abatement needs. With a drywall suspension system, we can create a curved, barrel-vaulted, or multi-level surface for your drywall application. This application allows us the ability to build to your design needs.